Currently touring as the John Jorgenson Quintet, Jorgenson creates a unique musical experience that equally enthralls the most discerning and the casual music fan. The group’s style has been called “gypsy jazz” after the dynamic string-driven swing created by Django Reinhardt and Stephane Grappelli in 1930s Paris, but Jorgenson’s compositions draw in elements from Latin, Romanian, Classical, Rock and Greek music, so “21st Century World Music” is perhaps a more apt description. The band’s all-instrumental debut studio album, The Black Market Trust, released in 2012, is widely regarded as a milestone in the gypsy jazz world. Through their debut album, lead guitarist Jeffrey Scott Radaich was acclaimed for his songwriting as well as technical prowess and musicality. 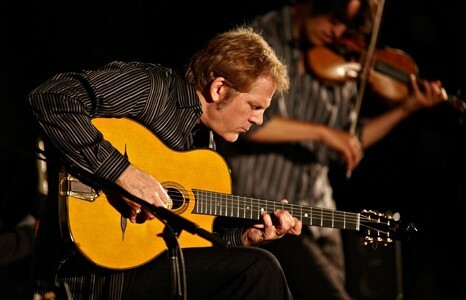 He has been touted as one of the most innovative and influential American acoustic gypsy jazz guitarists today. With their first release, the band established themselves as leaders and innovators by combining pop “Brill Building” sensibilities with the traditional sounds of Django Reinhardt’s Hot Club of France Quintet. The animated Pencilmation video, A Hole New World featuring their song Referential Integrity has garnered over one million YouTube views. With II ,The Black Market Trust has created an organic new sound that is daring, fresh and exciting, yet somehow still familiar and inviting. Combining old world romance with new world form, The Black Market Trust delivers a simple, elegant and well-defined classic sound. The Hot Club of Tucson (HCOT) was formed in 2004 by guitarist Allin Kibben (who has since left the group) to play the Tucson Folk Fest. Originally a 5-piece with rhythm guitar and clarinet, the group is now a trio consisting of violin, guitar and acoustic bass. 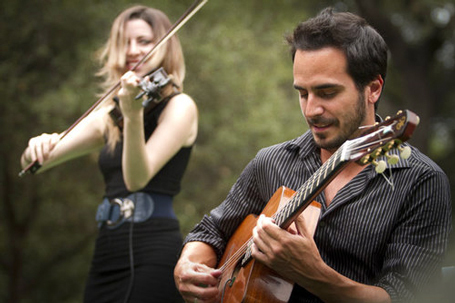 HCOT is a gypsy jazz group that plays the charming and virtuosic jazz music of Django Reinhardt and Stephane Grappelli. Because of our American traditional jazz influences, however, we like to break out of the usually-defined roles and interact with each other more than is common in the French jazz style. In 2013, HCOT released their 1st cd, Hot Club of Tucson LIVE!, a collection of the best recordings from three live concerts. HCOTs’ main gig for the last 5 years has been a weekly brunch at Hotel Congress on Sundays from 10:30 am-1:30 pm. The Gonzalo Bergara Quartet consists of Gonzalo Bergara on lead guitar, Jeffrey Radaich on rhythm guitar, Leah Zeger on violin, and Brian Netzley on upright bass. The music is heavily influenced by Django Reinhardt and the Hot Club of France, as well as the traditional jazz and music of Bergara’s true home, Buenos Aires. “Gonzalo Bergara’s music exists in a way that very little music does. He has lavished such care on every phrase, built each arrangement with such lapidary precision and pared away anything extraneous, the music becomes sculpture. It has weight, density, gravity. This is serious… and deeply moving. “GertieNtheT.O.Boyz” is one of the premiere ‘Waila’ Bands playing a mix of traditional and new Waila music. All band members are also members of the Tohono O’odham Nation which is located in Southwestern and Central Arizona. The name “Tohono O’odham” , abbreviated to “T.O.” in our name, means “Desert People” in our native language, and our reservation is substantial, equaling the size of the State of Connecticut. The Band consists of an Accordion, Saxophone, Violin, Bass, Bajo Sexto, and Drums. The term “Waila” translates into the word “Dance” in our native language, and is the most popular social dance music on the Tohono O’odham Nation. Waila music includes several varieties of polkas, chote’s (two-steps), Cumbias, Mazurka, and also Kwalya which is a type of square dance which is danced to at festivities of all occasions. GertieNtheT.O.Boyz has been in existence for approximately 10 years, sharing our music with people on and off the reservation, with other ethnic communities and celebrations, and at different events across the country. Gertrude Lopez, better known as Gertie, is the only female band leader on the Tohono O’odham Nation. Gertie Lopez is an ambassador for the Waila Music. She currently enjoys teaching music and singing on the Tohono O’odham reservation for the people from toddlers to Elders. Gertie also enjoys presenting to the youth on how to be a healthy musician.